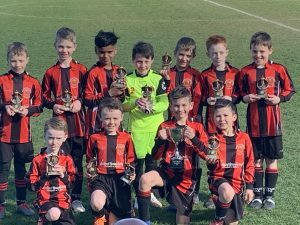 Droitwich Spa Boys & Girls Under 9’s Spartak team, lifted the Vin Furlong Memorial Cup against Newtown Sport Rangers, in the Fortis Cup Final. 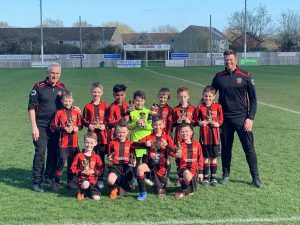 Played in fantastic sunny conditions at Malvern Town Stadium, Spartaks needed to recover quickly as they went one goal down after 10 minutes. After nerves settled and they managed to find their passing game, Spartaks equalised and then in quick succession went three goals up. Another goal before half time meant Spartak took a 1-4 lead into break. A much more relaxed Spartak team game out second half and played an assured attacking style. After some tough resilience from Rangers, Spartak found the net a further 3 times, finishing the game 1-7 winners. Head Coach Richard Bennett said “I couldn’t be prouder of the team, every player has contributed to this cup run. It is a great achievement to have reward for all the hard work that the lads put into every game. 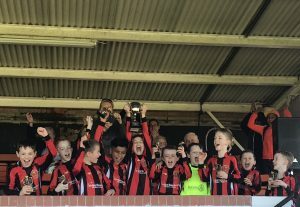 We have had a fantastic season so far and it was great to see the team win the cup. Newtown Sport Rangers were worthy opponents and we wish them well for the rest of the season”.